The lowest rated component performance indicator, is used as the Windows Experience Index of your Windows 8 computer. If you have not yet download Windows 8, you can find Microsoft Windows 8 download links for final release of free evaluation edition. 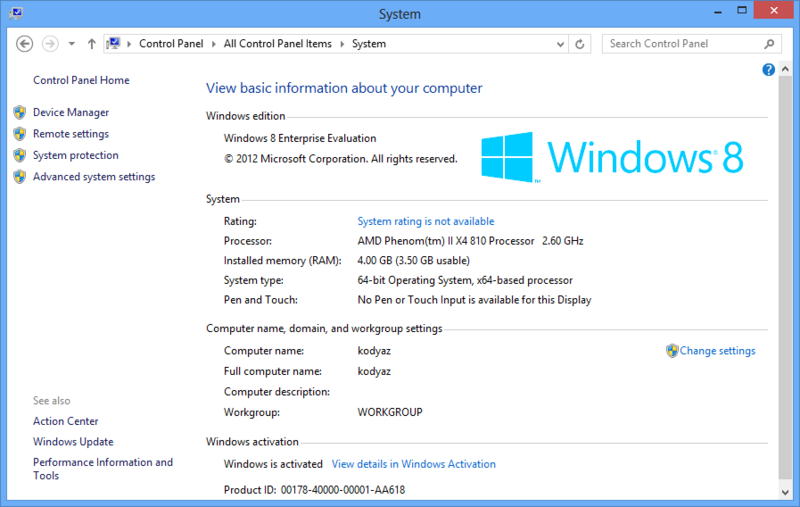 If you open System screen to display your Windows 8 running computer, you will see a screen like below. Windows 8 users can open Control Panel through Search Charm and then click System link to open this screen. As you see, basic information about your computer like operating system which your PC is running, the name of your computer and activation status, etc are all displayed on this screen. But what is important for me is the system rating information which is showing the performance rating given for each computer components. Since I launched System screen right after the Windows 8 installation is completed, the rating based on Windows Experience Index or WEI was not then calculated. In such cases where the system rating is not calculated by performance tools, System rating is not available text is displayed next to System Rating title. Any Windows 8 user get more detail about system rating by pressing this link button with text System rating is not available. An administrator can start Windows 8 system rating measurement by pressing the button Rate this computer.